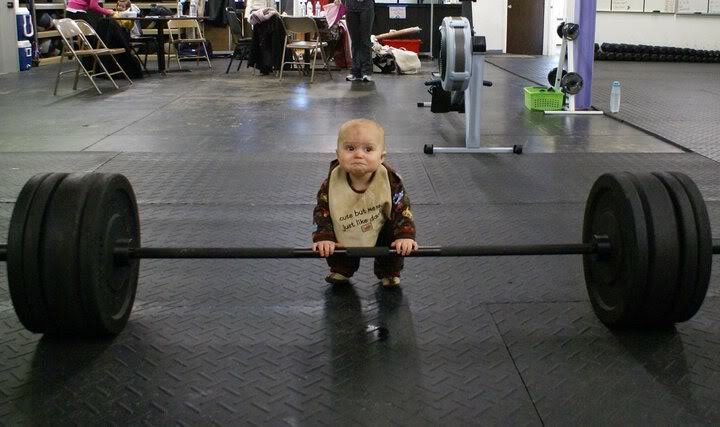 "Cute" and "Deadlifting" aren't typically synonymous....but in this case, they are! It's early Monday morning, and I hope everyone's weekend was as awesome as mine. Not only was my face melted by Eric Church at Country Fest on Friday, I decided yesterday that I should go for one of my 2012 goals: the 400 pound deadlift. Now, I should preface the following by saying that it's not a good idea to consistently test your 1 rep max as it's extremely taxing on your body and central nervous system. Plus, the risk of injury is always going to be higher when you're pushing yourself with heavier weights. I'm a big fan of getting a "sort of" max every few weeks or months to see where you stand, while still keeping a rep or so in the bank. However, yesterday I decided it was time to give it a go and see where I stand. The results? See below. Granted, 405 isn't that heavy by "internet standards," but it's still over 2X bodyweight for me. While I had calculated that I could pull 405, it's quite another thing to actually, you know, do it. I'm pumped to have hit one of my 2012 goals by the end of August, and I can't wait to see how much I improve by the end of the year.